So to the black sheep of the group! 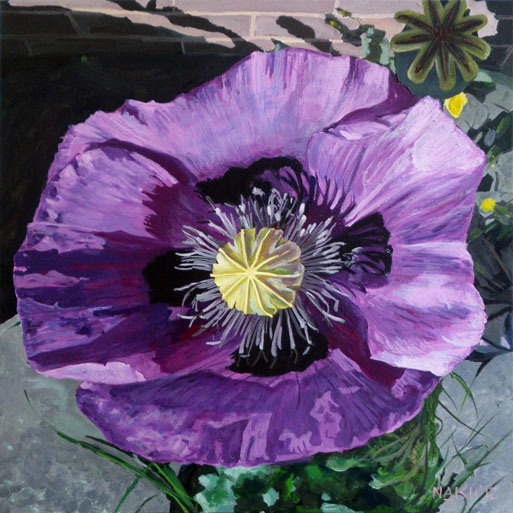 The one of the five submitted to the Luton Hoo Walled Garden exhibition that was not accepted. Sometimes it feels like a lottery, as this one in some ways is a favourite. There is no accounting for taste, and one digs for reasons as to why it might not be someone’s cup of tea. What can you do? Move on and enter it elsewhere or perhaps attack it with a Stanley Knife… there are various options. I chose to move on! This painting is based on a photo taken right outside my front door. I liked the abstract nature of the image and the various textures going on. I built it up with block colours followed by passes detailing it up. Perhaps it was because this type of composition is quite commonplace? No leave it; I’ve moved on honestly!